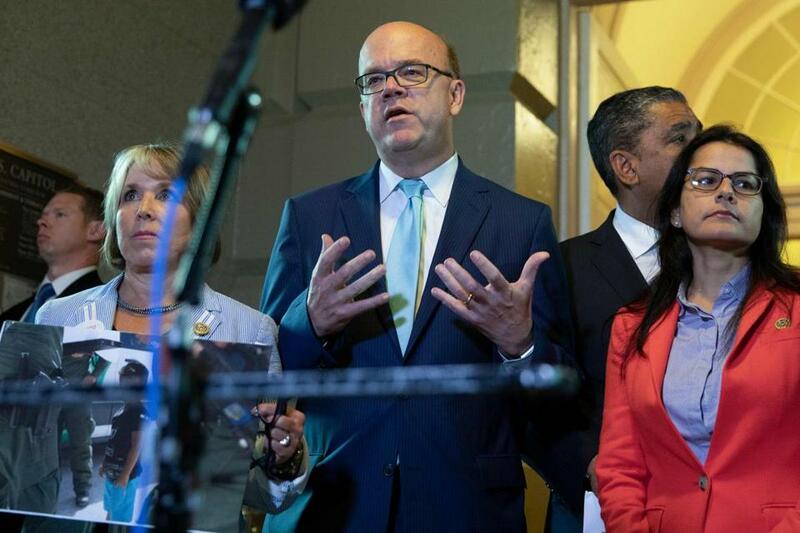 Representative Jim McGovern and Mayor Joseph A. Curtatone of Somerville are on a mission to expose violence and poverty in El Salvador and Honduras, they said Sunday, in the hope that a greater public understanding of living conditions there will help block President Trump from ending Temporary Protected Status for immigrants from the Central American nations. McGovern, a Worcester Democrat, said unless Congress intervenes, Americans will see families across the country torn apart, just as the nation watched this summer while parents and children seeking asylumn were separated by federal immigration officials at the US border. “Next time, it won’t be at the border, it will be in our own communities. We will see it in every city and town in the country,” McGovern said by phone Sunday from Miami, where he and Curtatone were en route to San Pedro Sula, Honduras. Temporary Protected Status, a humanitarian program that blocks deportation of selected groups of immigrants, was applied to Hondurans in 1999 after a hurricane and to Salvadorans in 2001 after two devastating earthquakes. The Trump administration’s plans to end the protections left almost 200,000 Salvadorans and more than 50,000 Hondurans with 18 months to leave the United States or attain legal status. McGovern and Curtatone said the administration’s argument that living conditions in the countries have improved significantly — as Homeland Security Secretary Kirstjen Nielsen said of Honduras in May — are not grounded in facts. José Flores Benitez, 31, a Salvadoran-American master’s student at the Harvard Graduate School of Education, said Salvadorans learn to take precautions in their daily lives because danger is everywhere. Benitez lived in El Salvador until 1998, when he was 11 and a gang member there killed his grandfather and his uncle in front of him and wounded his grandmother and aunt, he said. Much of his family still lives in El Salvador, Benitez said, and he has visited them many times, most recently in early 2017 for his brother’s wedding. He said the criminal gangs that control parts of the nation will threaten, extort, beat, or murder those who cross from one gang’s territory into another. “Things have not gotten better,” he said. McGovern and Curtatone are traveling with representatives of the human rights groups Alianza Americas, Centro Presente, and the Lawyers’ Committee for Civil Rights and Economic Justice and will speak to authorities and residents in the neighboring countries about their quality of life, they said. The Lawyers’ Committee is suing the federal government in US District Court in Massachusetts to block the removal of protections for immigrants from El Salvador, Honduras, and Haiti. McGovern believes Congress can pass an immigration bill that would extend those protections, he said, and save Deferred Action for Childhood Arrivals, a program that delays deportation for young people brought to the United States illegally as children, which Trump is also seeking to end. He said some of those facing deportation have lived in the United States for more than 20 years and have married, had children, and bought homes there. Curtatone, a fellow Democrat, said many Salvadoran and Honduran immigrants live in Somerville, and some have shared with him their fears that they will be deported. Policies that frighten immigrants and push them into the shadows also make it more difficult to build a community where every resident’s voice is heard and to address public health and public safety issues, Curtatone said. “What happens in Washington impacts our communities every day,” he said. The struggles of immigrants also resonate with Curtatone on a personal level as a first-generation American, he said, though his parents came to this country for economic opportunity, not because they feared for their safety.